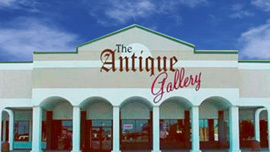 Antique Experience Lewisville is a group of established dealers offering an ever-changing Display of Quality Antiques and Collectibles. We have a huge collection of Advertising tins & Signs. We also feature antique paper goods such as Victorian era calendars, postcards, trade-cards & sheet music. Our inventory includes fine art, oils on canvas, oils on boards, lithographs, engraving, watercolors & prints. We sell Native American items including Indian rugs, pottery and collectibles, Western Itemssuch as spurs, guns and enamel ware, jewelry including estate, American Indian, costume, Gold & Silver, antique cameras, radios, telephones & knives. We offer a large selection of art glass & pottery including Fenton, Bellek, Nippon, Murano & Roseville. Our furniture styles include American, European, primitives & Art Deco.